A full skin check could save your life. At Skin Alert Cairns our Doctors see and treat thousands of patients every year with skin cancer and sun related skin disorders. As skin cancers can occur ANYWHERE on the body (even under undergarments) our Doctors offer all patients a full head to toe skin check. An important point to know, for example, is that not all melanomas are black. A melanoma can also be pink, purple, red, multi-coloured and even pale, thus it is important to have your skin checked thoroughly. 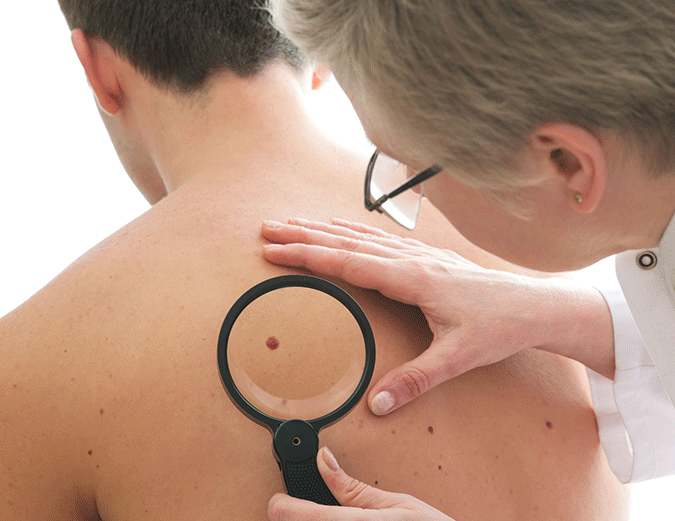 Skin cancer now affects 1 in 3 Australians under the age of 70. It has never been more important to protect yourself from the dangers of skin cancer. If you are concerned about any spots, moles or sun damage on your skin don’t wait until it’s too late. Book an appointment with Cairns’ most experienced Skin Doctors now. Rather than a GP who cares for a variety of patients, we have a qualified and dedicated team of Doctors and Nurses with a fully equipped surgery to provide the highest level of care and success for our patients. During busy times our Doctors are booked out for weeks to months at a time for a full skin check appointment. We want to accommodate all of our patients and so we try our best to fit people in at an earlier time that is convenient for them. In theses instances the Doctor will see you for a brief appointment to SPOT CHECK ONLY. Unfortunately a full skin check would have to wait for a later appointment when there is adequate time. We encourage patients to book for a spot check in those instances they are concerned about 1 spot only, any where on the body. Following that appointment you can schedule your regular full skin check at a later date. Emergency cases will be seen as soon as possible. In this instance you have a spot that you are very worried about, perhaps you have a history of skin cancer and recognise that you are at higher risk.Please tell us you need an 'emergency spot check' appointment and we will find a time to see you on the day. Consultation is by appointment. Emergency cases are given priority and seen on the day. We ask new patients to arrive 10 minutes early to complete paperwork. Please supply us with your Medicare card and any concession cards at this time. On busy days there can be waiting times. If we are running late it is because unforseen emergencies arise during the day that requires immediate attention. We appreciate your understanding regarding this. The Doctors have a duty of care to each and every patient they see. Our Doctors will carry out a full head to toe skin check. We ask that you come with all makeup and nail polish removed. In order for the Doctor to inspect all areas of the skin, you will be asked to remove your clothes down to your underwear. You will be appropriately draped while the Doctor then performs the skin check. You will receive a reminder SMS of your appointment the day before. Please advise us at this time if you are confirming, cancelling, or re-scheduling. Please advise us if you need to cancel or re-schedule your appointment well in advance, as we often have a waiting list and like to accommodate other patients where we can. If you have an excision you may or may not be billed on the day. You may instead be billed when you return for suture removal, or when the results come back from pathology. If you do not return for suture removal, you will receive a postal bill. We offer Medicare Easyclaim for eligible services. Once you pay your account your Medicare Rebate is paid back to your Debit card within 4-7 business days. Please contact us if you require clarification of our fees.